Whenever I don't know how to explain something to Hannah I turn to books. Sticky Icky Booger Bugs by Sherry Frith is the tale of a boy’s battle with cystic fibrosis as he attempts to avoid the hospital. The main character is Kory, who is just like any other kid. Like Hannah he LOVES chocolate milk and watching TV. He also loves recess, playing soccer, and exploring his neighborhood with his best friend. The book shows how with every puff, cough, and sneeze, Kory keeps the sticky icky booger bugs away so he can have fun every day. Hannah loves the illustrations and easy to follow story line. While I don't think she grasps exactly what cystic fibrosis is, I think she learns a more important lesson - that all kids enjoy the same types of things regardless of what they might be up against. And of course, every time I say "Sticky Icky Booger Bugs" it makes her smile. Sticky Icky Booger Bugs is a great way to teach any child about cystic fibrosis - the most common fatal disease affecting Canadian children and young adults. There is no cure. The author Sherry Frith wrote this book after her sons, Kory and Kevin, were diagnosed with cystic fibrosis. She wanted to explain aspects of the disorder using words they could understand, and she has definitely achieved her goal. 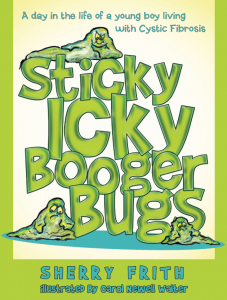 One lucky YYZ Bambina reader will win an ebook version of Sticky Icky Booger Bugs! Open to Canadian Residents (excluding Quebec) who are the age of majority only. Valid entries only. Contest ends February 12, 2014. For further contest rules, refer to the Terms and Conditions within the Rafflecopter. Disclosure: I received a copy of this book for the purpose of this review. As always, all opinions are my own. I think it's important for my daughter to learn about things other kids might be going through so that it's not an unknown to her. I love the title and premise behind it. It is important for kids to understand what is going on with other kids, how to help them or why they won't be in class. I wish there were more books like this. Miss R's got a lot of questions about disabilities and this would be a great way to help her understand. I work in child health care so this would be a great book to add to our library.